She’s flirting with me. She’s definitely flirting with me.The way she circles past. How her eyes follow me. Finally, she works up her nerve and stops. Through the glass, our eyes meet and her face reveals an enigmatic smile. She opens her mouth and seems ready to speak.And then she bares her sharp teeth, pops her jaw a couple times and starts rubbing her gelatinous melon head against the glass.Such is love at the Mystic Aquarium. She’s a beluga whale who, having traded cold arctic waters for more refined surroundings and a steady diet of frozen herring and head scratches, now swims laps inside this oversized fish bowl for our entertainment.It’s easy to anthropomorphize these whales. I sit in front of the thick acrylic wall and watch as the beluga circles past again and again. Each time, she stops, looks me over rubs against the glass before moving on. She’s so hitting on me. A guy with the aquarium staff tells me not to get my hopes up. “That’s Inuk, the old male. He likes to be dramatic. He’s like that with everybody.” He was brought in seven years ago with hopes of breeding with the two females here, but he has shown no great interest. I could be wrong, but I’m pretty sure he’s flirting with me. Photographed May 28, 2009 in Mystic, Connecticut with a Hasselblad 2000 and Rodenstock 3x loupe on Fuji Neopan 400 black and white negative film. This entry was posted on Sunday, December 25th, 2011 at 4:29 pm. 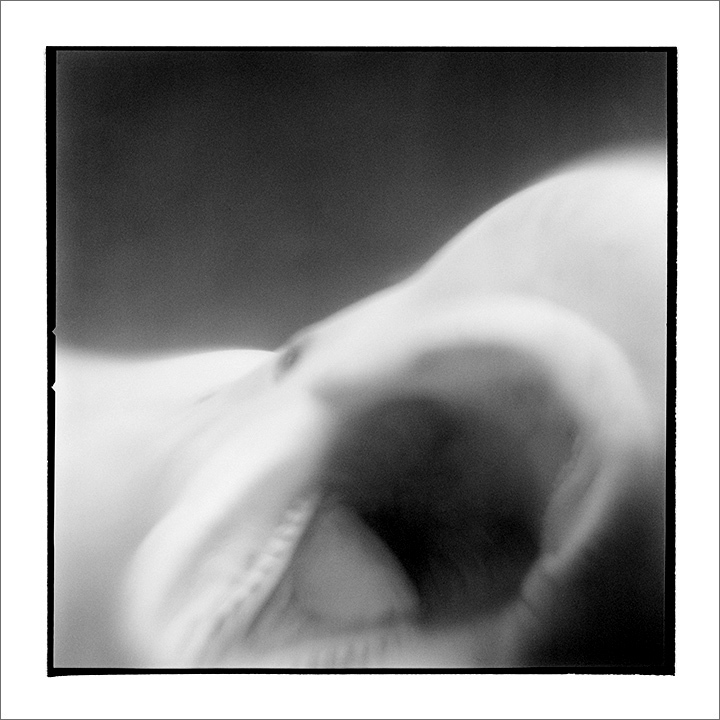 It is filed under Monochrome and tagged with Americana, Beluga, Black and White, Blurry, Connecticut, North America, Whales, Wildlife. You can follow any responses to this entry through the RSS 2.0 feed.